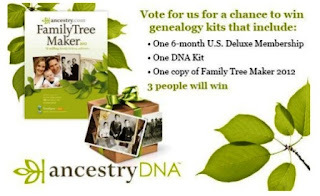 Finding Mary Cordial: Ancestry.com Contest -- Enter Now! Ancestry.com has launched a Facebook promotion to better their chance at winning Utah Business' People's Choice Most Admired Companies Contest. Three lucky winners will be chosen. Vote now by clicking here.